Living a solitary life on the windswept plains, Judson Miller often swept into the town of Scorpion Gulch to sweep out the riffraff. Soon, very soon, he planned to propose to Miss Lily Frymoyer, who no doubt would be swept off her feet. THAT is an amazing piece of work Krista! Hey Krista, you had me chuckling with this one, and boy, you have been busy as a bee. Or a cowboy in the wild west. It always amazes me how well you tie in the individual pieces in your work. You just have that wonderful trained eye that makes it all look so easily. I should get you to hang our next show. ! You could make anything hang together I think. I just love your work. Gorgeous! You, little lady, sweep me off MY feet! This is better than a tall cold glass of sarsaparilla on a hot, dry, dusty day! What fun to look at!!!!! This is amazing, but then you are! The details, the color, the energy!!! How, How? I just want to know! 🙂 Beautiful illustration! 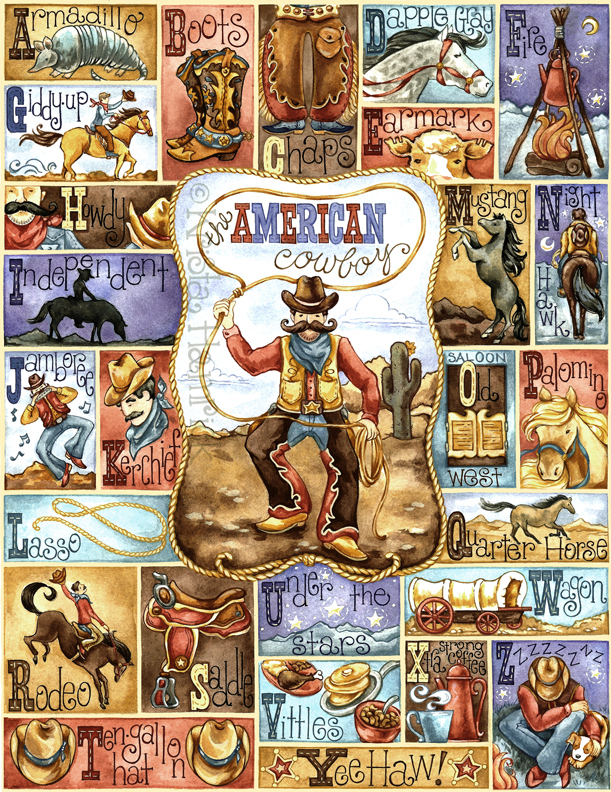 love the cowboy art Krista! Yee Haw!!! Wow! Just beautiful… I am always amazed at your intricate work and details! How could Miss Lily not be swept off her feet?! He might need to sweep that mustashe too!